Noted basket artist Dorothy Gill Barnes will lead a workshop at Penland School of Crafts in North Carolina this summer. The workshop entitled - From Nature: Textiles/Sculpture will be held May 30 - June 11, 2010. Students will use respectfully harvested heavy and delicate barks, grasses, wood, vines, and roots gathered from the Penland landscape, to construct vessels or sculptures using a variety of techniques including carpentry, sewing, weaving. 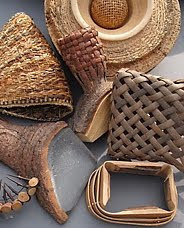 Dorothy is well known for her expertise in using native natural materials in her sculptural basketry. For more about bark and other native naturals used in basketmaking visit BasketMakers.com.